I encountered an unfamiliar brainteaser when helping* my son with his mathematics assignment. 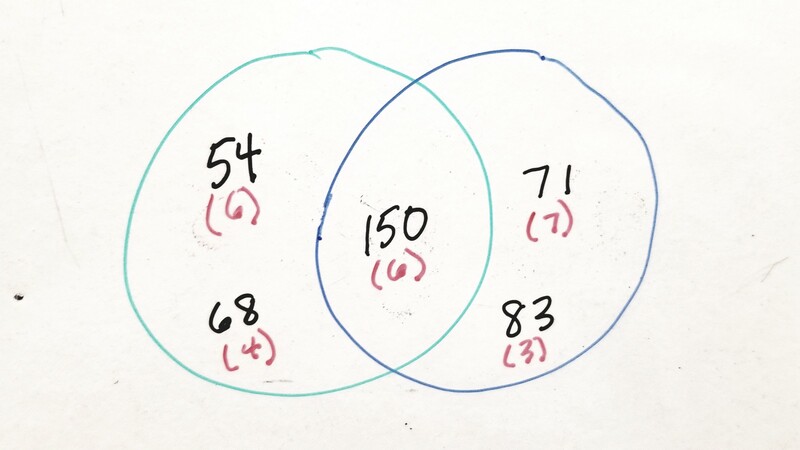 I love a good Venn diagram, so I initially thought these problems would be a piece of cake. (Foreshadowing music begins to play in the background.) The experience of working through successively more difficult versions of the same problem made me think about the nature of empathy and our ability to relate to one another’s stories. But first, My Spiritual Journey from Problems to Strategies to Solutions, in seven terrible photographs of a dry-erase board. 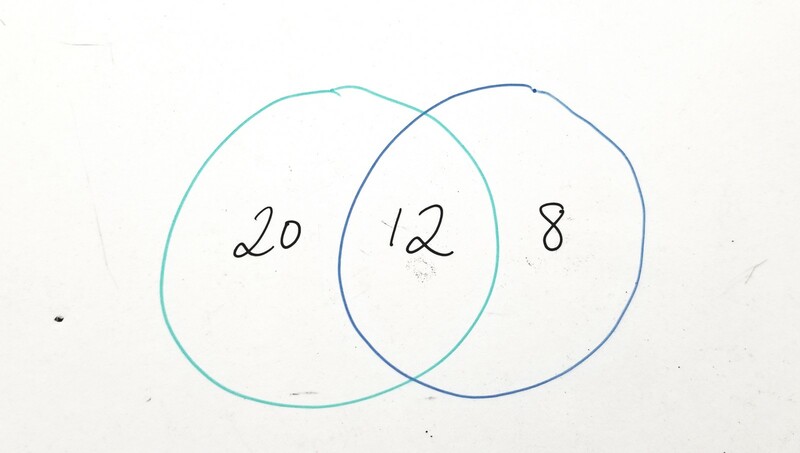 To start off, you’re given a set of three numbers and have to put them into two intersecting circles such that the sum of the numbers in each circle is a multiple of four. Here’s an example: 8, 12, 20. Look! I did it! That black dot is on my dry-erase board, not your screen. It will reappear. 28 and 20 are both multiples of 4. Woot! What mathematical acumen I displayed! But look! I could solve it another way! Do not adjust your screen. The dot persists. 20+12=32 and 12+8=20. It’s almost like this isn’t even a problem at all! We’ve certainly earned a restorative snack break by this point, but let’s move ahead and try one more problem. This time, the list is: 2, 6, 12, 20. 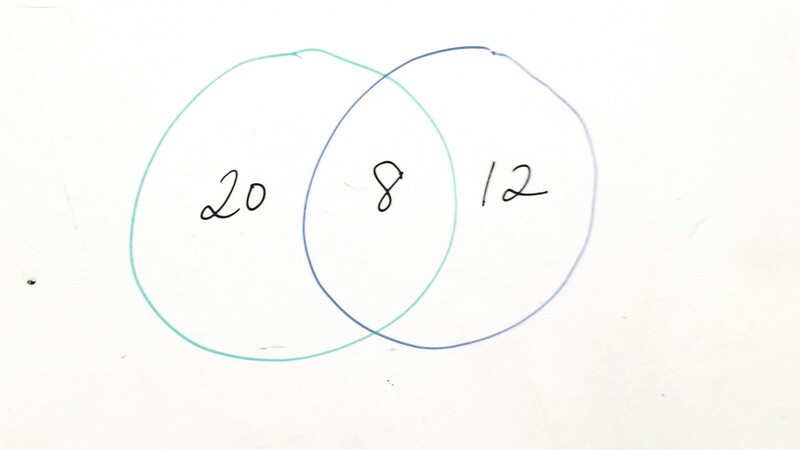 Again, place the numbers such that the sum of the numbers in each circle is a multiple of four. It took me a moment, but the solution is to combine the 2 and the 6 to make 8. 8+20=28 and 8+12=20. A great day’s work! I’ve mastered this type of problem! Do they give genius grants for math brainteasers? I mean, I know I have a bottle of marker cleaner somewhere. Why not use it? Let’s celebrate with just one more. Mixing it up just a bit, let’s try 127, 455, and 865. 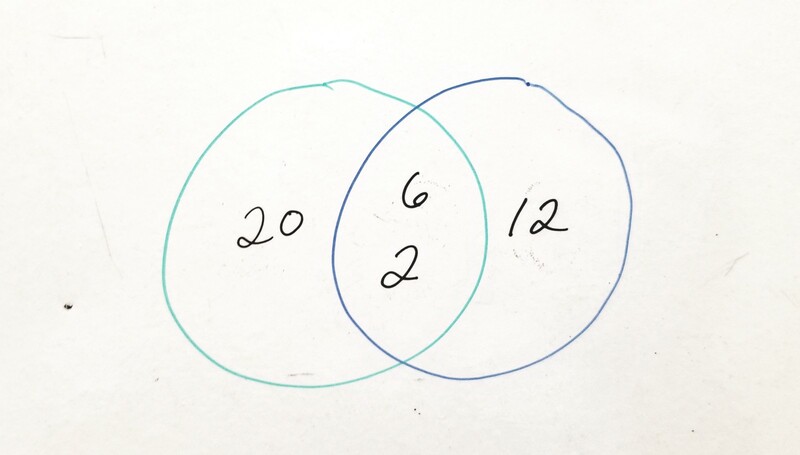 Place the three numbers such that the sum of the numbers in each circle is a multiple of four. Well, I mean, I could add each pair of numbers, figure out if the answer was a multiple of four, make a list — sure, that would work. 127+455=582, which has a remainder of 2 when divided by 4, so that won’t work. However, it has become clear that this strategy is a little tedious. You’re thinking the black dot was erased, but it shall resurface. Sorry about the false sense of security there. 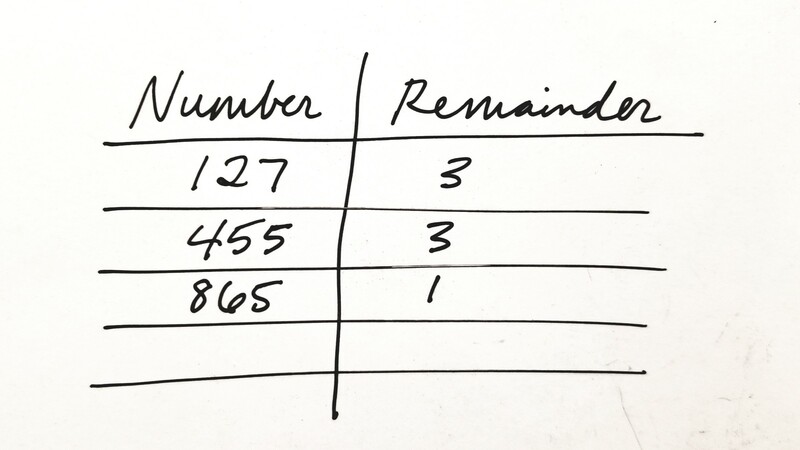 This type of problem becomes simpler if you work with remainders. Instead of having to add the individual numbers to find multiples of 4, you can sort through the “leftovers” to make new groups of 4. 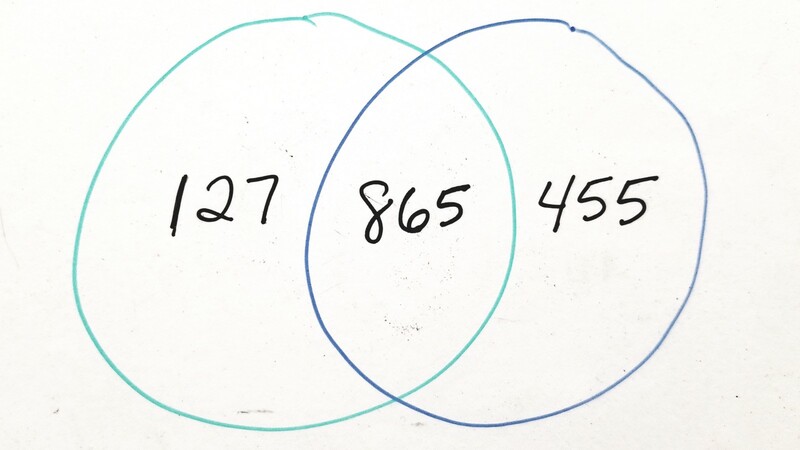 I can see from the chart that I would have two ways to combine 3+1=4, so the 1 must be the number that ends up in the center of the diagram. Here’s a harder version that still becomes relatively easy once you use the remainders to solve it. The list is: 54, 68, 71, 83, 150. And let’s say that the numbers in each circle need to add up to be multiples of 8. It would take significantly longer to have to add up all of the potential combinations of numbers! I’d probably be overwhelmed and give up. Looking at their remainders makes it easier to see the options. I’ve written the remainders in red below each number to show how this would work. HOW DOES SHE HAVE TIME TO PHOTOGRAPH THE WHITEBOARD BUT NOT TO CLEAN IT? 6+6+4=16, and 6+7+3=16. 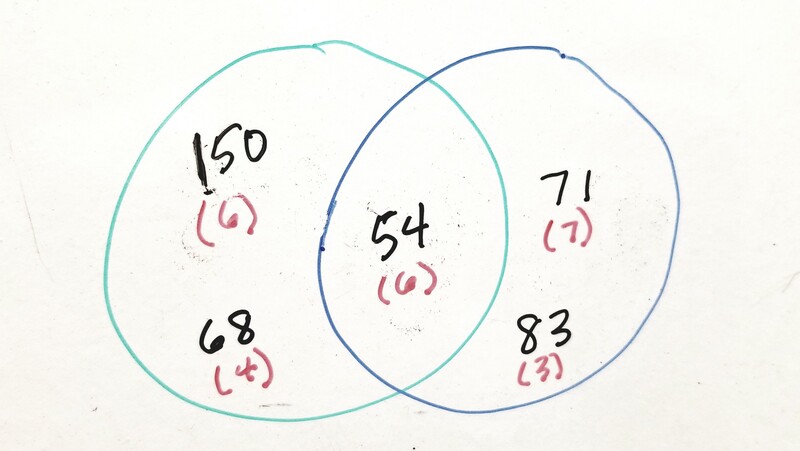 Because 16 is a multiple of 8, that means that when we add the three corresponding numbers together in each circle, their sum will be a multiple of 8. There are actually two solutions to the problem. (Disclaimer: there may be more, but I am definitely an amateur!) I can switch the 150 and the 54 and still have the numbers in each circle sum to a multiple of 8. FOR THE LOVE OF MATH, PLEASE ERASE THE BOARD. HAVE A HEART. So how does this relate to empathy? I thought of the times a friend has shared a situation with me and I’ve replied with something like “I had a problem just like that.” I’d explain in my most helpful voice how I was able to solve the problem, knowing that my example would be just what this friend needed to hear to find the solution. I’ve also been on the other end of these conversations, where I described a problem and could tell that the other person didn’t really understand why this was even a problem. The solution is obvious! There are infinite solutions! Why was I even worrying about that? And from this experience, I know that sometimes I may be sharing some of the information about a problem, but am not comfortable revealing the full context. Perhaps empathy requires that we assume the other person has a much more daunting list of numbers, such that the strategy that works handily in simple situations would be cumbersome or inadequate. The other person may need to approach the problem differently, cobbling together remainders to make things work instead of being able to toss the numbers in the circles any which way. It seems like our “authenticity everywhere” social media-drunk society, we would be better equipped to understand one another’s circumstances. But even with our closest friends, we may be reluctant to share all of the relevant details about a problem — our list of numbers. Often, it may not be appropriate to do so because of concerns about trust or the privacy of the individuals involved. A helpful step would be to assume that the friend who is telling you about a challenge may be holding back details that would mean the approach that worked so well for you would be unhelpful. In fact, it may make the issue seem even more daunting to be told, “I had a problem just like that.” Something as simple as rephrasing advice — “I’m not sure if this is a similar situation, but when I had to deal with ______, what worked for me was ________” would show more genuine empathy and keep the conversation going for the person who is truly overwhelmed in the moment. We know we should try to see the world through the other person’s eyes or walk a mile in the other person’s shoes, but the assumption that what’s been shared with us is all of the information about the problem is — well, problematic, I guess. The next time I’m feeling impatient with another person’s inability to handle what seems to me like a fairly straightforward challenge, I hope to keep in mind that I probably am missing crucial details that would require a completely different solution than the one that seems so obvious to me. Dorian Speed is a freelance writer and educator living outside Houston.